Why Can't I view AMC Shows like "The Walking Dead" and "Breaking Bad"? 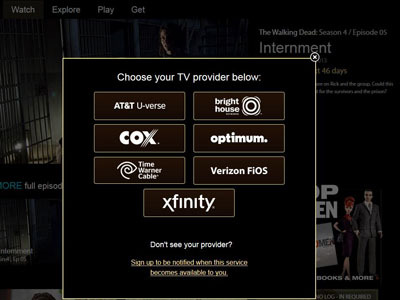 Unfortunately, AMC shows like The Walking Dead and Breaking Bad are not available to watch for free online. AMC is more selective with their content online and since we not own or host any of the content on the site, we have no control over what exactly is made available to the online community. AMC will sometimes make season premier episodes available, but not full seasons. If you have a cable or satellite provider, you may be able to gain authentication to full episodes, in the event that your provider is included in AMC's list. Otherwise, episodes and full seasons will also be available for online purchase through Amazon Instant Video. Just follow the "Buy/Rent" button on the show page to purchase episodes or full seasons.